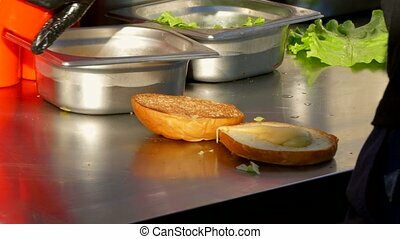 Female hands making snack roll of caviar cheese and cucumber. 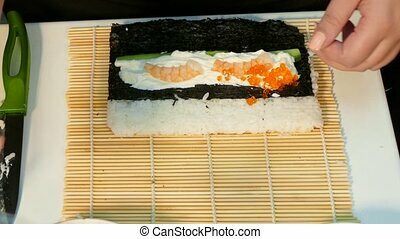 The cook adds shrimp and salmon caviar to the stuffing of sushi. 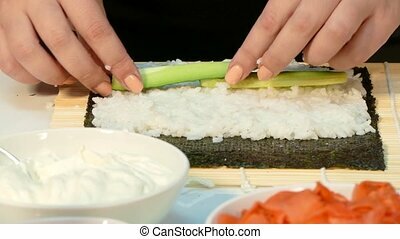 The cook turns the nori sheet with the boiled rice on the bamboo mat and spread the stuffing. 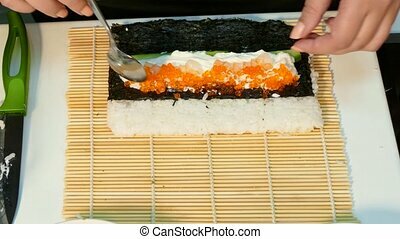 then rolls the sushi roll. Fast moving. Cook put salmon in the stuffing of sushi. 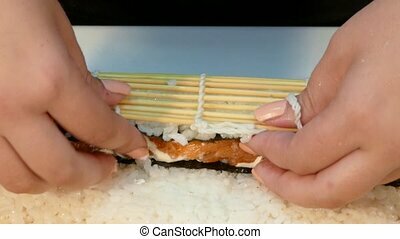 Then rolls the sushi roll. Then he places the salmon meat on top of the sushi roll. Cook put salmon in the stuffing of sushi. Then rolls the sushi roll. Then he places the salmon meat on top of the sushi roll. Fast moving.